I really love this serie. I wan to can see Dan Stark again. Watching this show on Netflix, love it!!!! I discovered the show on Netflix, I hope it gets revived as a Netflix series. I watched this show when it was on TV in 2010 and I’ve been watching it on Netflix the past couple of weeks. I love this show and wish it had been received better by the masses. Love Bradley Whitford. I just watched season 1 on Netflix and LOVE it. I don’t remember seeing this back in 2010. I love the humor and the cast. Simply unbelievable that this show was canceled. Is it too late for season 2?? You should get to work on this. i just discovered the good guys and i watch it until my eyes go blurry. it isn’t just one person, it is the whole cast. i hope they make some more episodes just for netflix. it is hysterical. i have seen poor rated and boring shows kept on for years so it seems kind of “fishy” this one was cancelled. Why would you cancel a good show like that???? I really enjoyed this show and it is so much better than others that are still on. Can’t understand why and who makes that decision. just found this gem on Netflix. this was made when writers were smart enough to write & include humor & still have a plot. fox didn’t get the word out on this one. it’s crazy fun. too bad would have watched 10 seasons of this one. 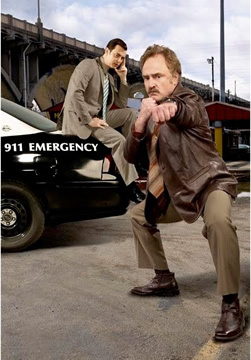 bradley whitford is great! colin hanks was more talented in this than anything else he’s done. Who are your Nelson families? People that like R rated gory shows that involve sexually explicit content and lots of swearing? I ask this because repeatedly, family friendly shows that make us laugh and keep us entertained, get cancelled after their first season!! It’s not right. One of the best shows ever created. The music and Brad W. Simply rock. We have watched reruns on Netflix relentlessly. Definitely ahead of its time. So sad most TV viewers didn’t realize what a gem this show truly was. We could do with a season 2. I loved this show. Great Humor. It still is amazing to be the shows that are canceled and the awful shows that remain. I remember when Luck got canceled. That wa also a great show. In my opinion, these shows need some better PR in the beginning of the season. Sadly the show was way to ahead for its era, if it was rebooted for this generation should rack up better income. It was a great show, lets bust some punks!! !